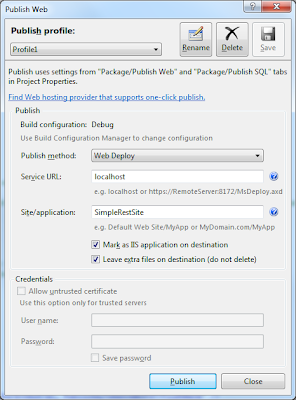 In order to remove .svc from REST URL, we can use ASP.NET routing in .NET 4.0 or above. (1) Assume we use the same Simple REST WCF project as in previous post. (2) In Web.config, add UrlRoutingModule module and UrlRoutingHandler handler which are required for ASP.NET routing. (3) In Web.config, set [aspNetCompatibilityEnabled] attribute to true in WCF host environment. (4) Add New Item - [Global Application Class]. This will add global.asax. (5) Add Reference to [System.ServiceModel.Activation.dll] to use ServiceRoute class. 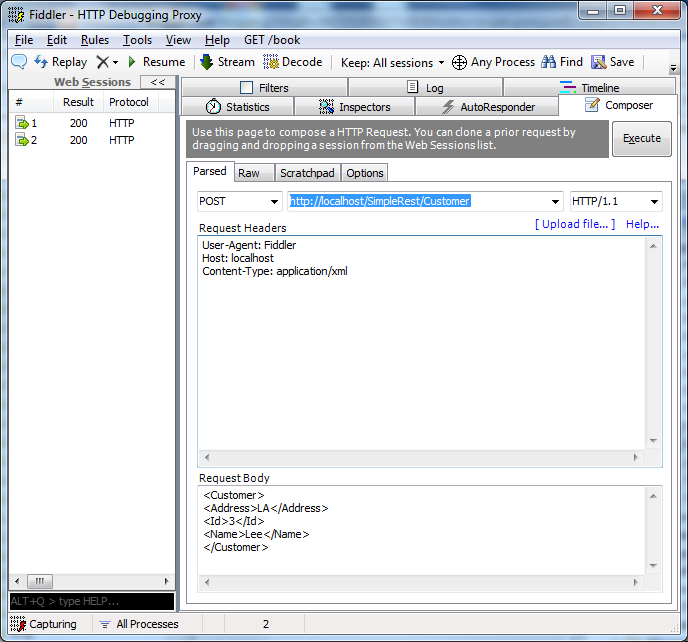 (6) In Global.asax.cs file, add a Routing entry for REST service. With this routing information, .svc can be omitted. And here is an example of REST POST without .svc. (8) By the way, SimpleRest is web application name, if we want to remove that as well, we can create a Site in IIS Manager and publish REST application onto the Site root. 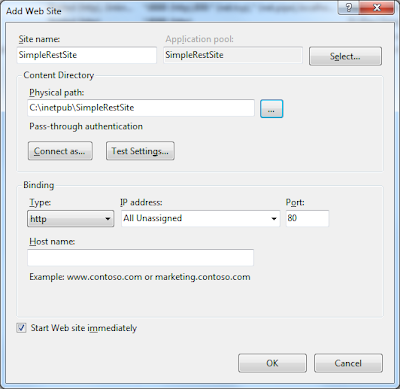 Specify any site name and local folder path for web service. You can choose port 80, but only one port can be assigned to one IIS worker process at a time. So you might need to change Default Web Site port to other number like 8888. 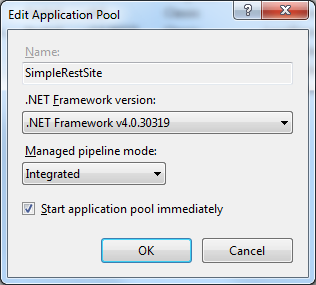 Ensure that the Site uses .NET 4.0 (or matching version) in [Application Pools] of IIS Manager. And change process [Identity] appropriately if needed. In VS, Publsh REST web service to the Site root. So now we can use more precise URL such as http://localhost/test , http://localhost/Customer/1. Where did this key come from? b03f5f7f11d50a3a is the public key token of Microsoft for System.Web.dll file. You can check it from ILDASM or the following sn.exe command.